This lesson can be used as a pre-lesson for the Whose Point Is It Anyway? lesson plan. Students will be able to describe two characters’ perspectives with contrasting conjunctions using a top hat graphic organizer. Write the following student-friendly objective on the board: "I can talk about two characters' perspectives with conjunctions using a graphic organizer." Ask students to turn and talk to their partner for 30 seconds and share their ideas on the meaning of the word perspective. Poll students with their thumbs up, sideways, or down to show their understanding of the word. Choose a non-volunteer to read the student-facing objective you've written on the board. 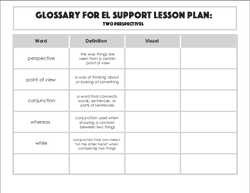 Provide the definitions for perspective and conjunction, or allow a student to define the terms. Tell students they'll read about two sides of one story and contrast the two perspectives using a conjunction. Read the book or show the video of a Tale of Two Beasts (see related media) or another book with different perspectives shown regarding the same events. Ask students for their impression of the book and to explain the conflict or problem of the book. For example, "The girl and the beast have very different perspectives for each event that occurs in the book." 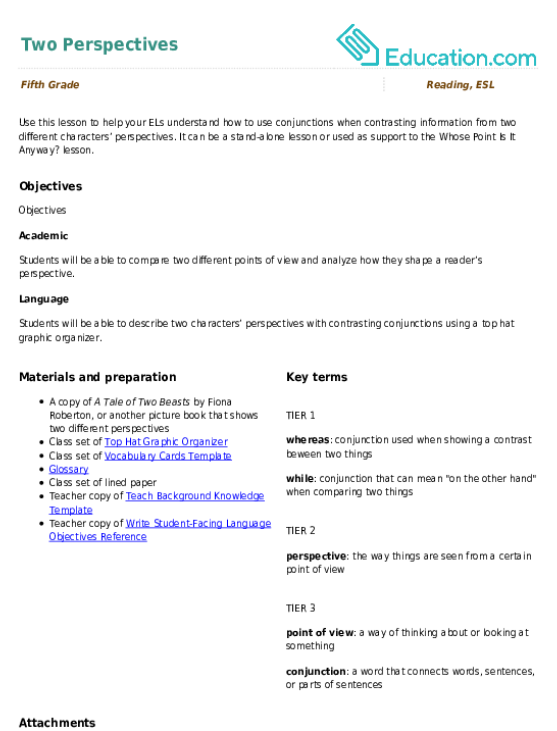 Display the Top Hat Graphic Organizer and explain that they'll write each character’s thoughts or actions given a specific event in the two columns. Tell them the bottom box is for similarities between the two characters' perspectives for a specific event, but they won't use that section for this lesson. List one thing that happened in the book and each of the characters' feelings or attitudes about the event. For example, write the following: "The girl rescued the beast because he was sad." For the same event, write another sentence: "The beast was singing happily when the girl ambushed him." Ask another student to share another event that occurred and how the beast and girl felt about the occurrence. 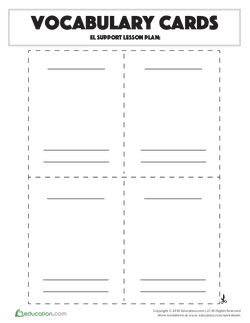 Distribute the Top Hat Graphic Organizer and ask students to complete the list of events from each character's point of view until they have four total events with each of the characters' perspectives represented. "The girl thought ____, while the beast thought ____." "The beast ____, whereas the girl ____." 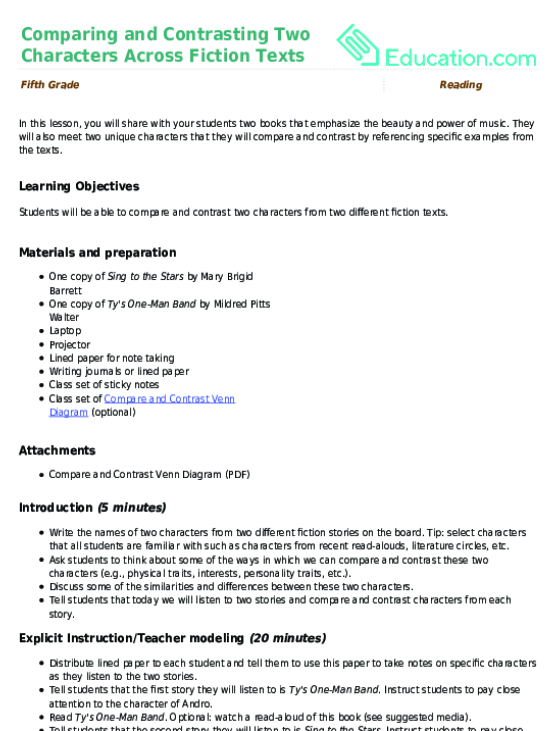 Read the sentence frames and define whereas and while using the Glossary. Tell students they’re conjunctions that highlight a difference between two different things. Ask another student to give an everyday example using two subjects and the new vocabulary terms. Explain that they'll use these sentence frames to describe the differences between the two characters' perspectives about a given event in the book. Display the completed Top Hat Graphic Organizer and model creating a sentence using a sentence frame from the board to illustrate the two different perspectives of one event. Ask a student to repeat the sentence. Then, ask an advanced EL to say a new sentence using the same event but a different sentence frame. Distribute a lined sheet of paper and ask partners to write two sentences using the next two events. Then, ask partners to switch and share their sentences with a new partner. Choose two students to share their answers and correct misconceptions with student input as necessary. 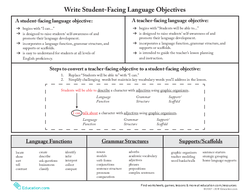 Provide cloze sentences and a word bank for the fill-in-the-blanks for the Top Hat Graphic Organizer worksheet. Allow students to explain their answers to their partners in their home language (L1) or their new language (L2) using the word bank and sentences. Define key vocabulary terms essential to the story during the read-aloud. 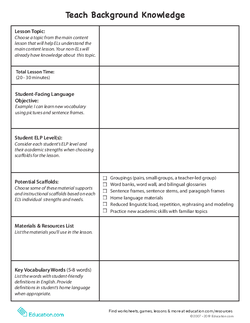 Provide the Glossary and Vocabulary Cards Template worksheets to allow students to take notes on the new terms and draw pictures for the words. Pre-teach a lesson on describing events in a text based on one narrator's perspective before this lesson. Ask students to summarize the text after you read it aloud and be the first to recall some details from the two perspectives. Pair beginning and advanced students with the same L1 and allow them to speak in their L1 while discussing the text and their Top Hat Graphic Organizer answers. 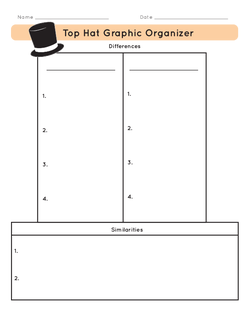 Allow them to complete the bottom box of the Top Hat Graphic Organizer that includes the similarities between the two characters' perspectives. Ask ELs to write new sentences with the following sentence frame to see the difference in sentence structure when the word "while" is in the beginning: "While the girl thought ____, the beast thought ____." 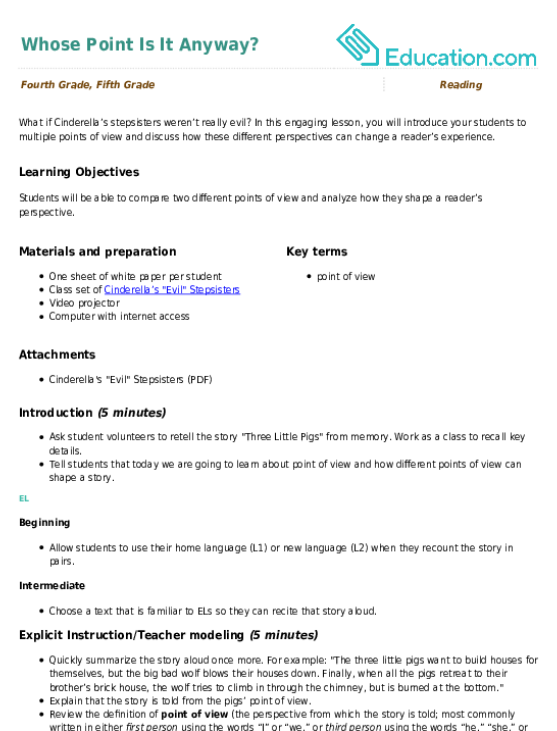 Ask students to write on their lined paper one sentence using the conjunction "whereas" or "which" to describe the fourth event listed on the Top Hat Graphic Organizer. Remind students of the sentence frames on the board. Have students share their answers with their elbow partners and allow them to adjust their answers as necessary. Choose a volunteer to share their sentence from their formative assessment. Ask a student to share the most shocking difference in perspectives between the two characters. Introduce your students to two myths from different cultures.